I think Tom Green’s “Freddy Got Fingered” had the same effect as King Kong jizzing on Jessica Lange AND Naomi Watts. But really i think less about gun control/violence when i saw this flick than about the twisted Southern mentality it took to institute slavery and the injustices incurred upon an entire race of people held down and subjugated. And i also think about the current political backwardsness of the South crying bloody murder over Obamacare (attempting to deny the poor, sick, and elderly the care they need [how Christian!]) but having no problem with the wars of Bush begun on false pretenses and racking up trillions in deficit in effect crippling the economy of our country. Hypocrisy is still alive and flourishing in the South and that’s why this movie is so relevant. 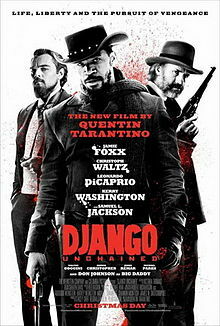 “Django Unchained” is the perfect movie to show during the presidency of Obama. That’s the political social point–not guns. Anyways, i loved seeing this gem at the theatre. i laughed like hell during certain parts of this movie–especially the mob scene with Don Johnson then then with DiCaprio arguing with Samuel Jackson. Tarantino writes a mean script and i was thoroughly captivated the whole story! Even more so than my other favorite “Deathproof”.